Casey: "I wanted to get my story about our trip to Rio Bravo out forever to read"
Casey Parsons writes that she's now pregnant and the baby is due 09/11/2004. "I went to Mexico to have my reversal on March 1, 2003. I just found out I am pregnant!!! We are all so excited. We owe all the glory to God!! If it wasn't for Him this wouldn't be happening. Another member of the group just posted about being pregnant. She and I were next door to each other in the hospital in Mexico. For all that want the details of my reversal here it is: tubes tied on 11-15-95. Reversal on 3-1-03. tubes are 4 to 5 cm on each side. due date is 9-11-04." "Hi everyone. I want to say thanks for all the prayers that were said for my family. I am still a little sore, but I wanted to get my story about our trip to Rio Bravo out forever to read. The one thing I would like to get across is -- if you're thinking about making an appointment, do it! This (I think) is the most wonderful and caring doctor you could ever get to do a tubal reversal! I saw where someone asked about how many reversals they do, A LOT! Couples just keep coming. While I was there I got to meet Misti and her husband from the group. They are wonderful a couple. Misti had already had her surgery, and I was having mine the next day and she really put my mind at ease." 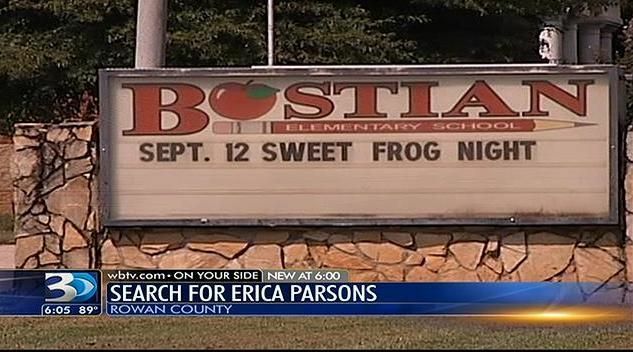 "I find terribly sad that no one that knew Erica has named her favorite color or game or music group or TV show or place to go out to eat"
"On Monday, WBTV was contacted by a former staff member at Bostian Elementary School, in China Grove, who said she was bothered that there was so little personal information about Parsons. The staffer, who requested not to be identified, pointed out that while much has been made of the fact that Erica Parsons was home schooled for most of her life, there was a time that she was a student in the public schools in Rowan-Salisbury, and possibly in Cabarrus County." "I remember that I saw her individually sometime. 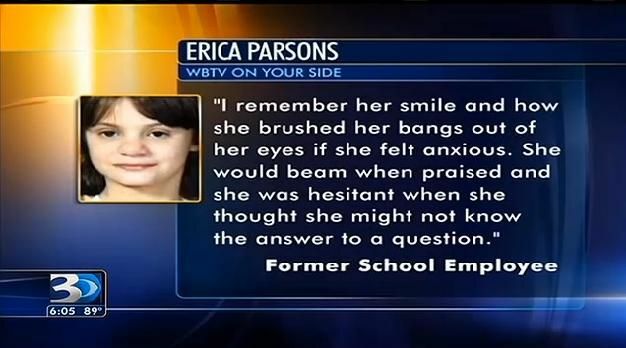 I remember her smile and how she brushed her bangs out of her eyes if she felt anxious," the staffer wrote to WBTV. "She would beam when praised and she was hesitant when she thought she might not know the answer to a question -- that's when she would brush her bangs away from her eyes and puff air out of her mouth. 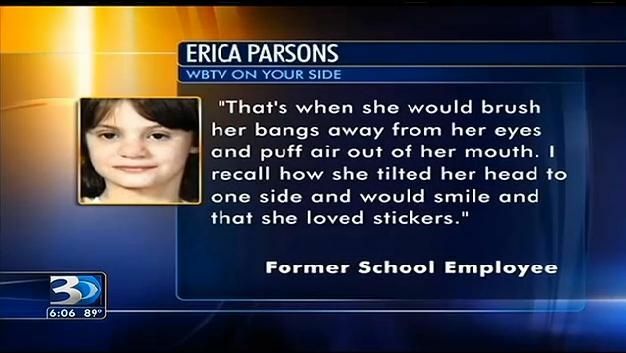 I recall how she tilted her head to one side and would smile and that she loved stickers."